Persistent short-term memory loss resulted from this turbulence and Glen Campbell would have few constants in his life as the years waned on. One of them, however, was the co-author of this book, his daughter Debby. She witnessed his struggles and suffering, both musically and personally, as well as the beginning of his decline into Alzheimer’s disease. 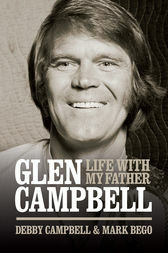 Burning Bridges: Life With My Father Glen Campbell is a loving but unflinching reminiscence of a multi-talented musician, a troubled man and a father. Debby Campbell provides a poignant, eye-witness account of a musical legend like no other.